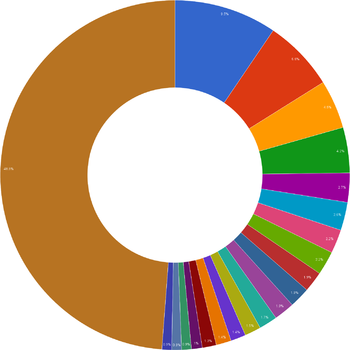 These are lists of the most common Chinese surnames in mainland China (People's Republic of China), Taiwan (Republic of China), and the Chinese diaspora overseas as provided by authoritative government or academic sources. Chinese names also form the basis for many common Vietnamese, Korean, and Japanese surnames and to an extent Filipino surnames in both translation and transliteration into those languages. The conception of China as consisting of the "old 100 families" (Chinese: 老百姓; pinyin: Lǎo Bǎi Xìng; literally: 'Old Hundred Surnames') is an ancient and traditional one, the most notable tally being the Song-era Hundred Family Surnames (Chinese: 百家姓; pinyin: Bǎi Jiā Xìng). Even today, the number of surnames in China is a little over 4,000, while the year 2000 US census found the number of American surnames held by at least 100 people to be more than 150,000 and more than 6.2 million surnames altogether. The Chinese expression "Three Zhang (or/and) Four Li" (simplified Chinese: 张三李四; traditional Chinese: 張三李四; pinyin: Zhāng Sān Lǐ Sì) is used to mean "anyone" or "everyone", but the most common surnames are currently Wang in mainland China and Chen in Taiwan. A commonly cited factoid from the 1990 edition of the Guinness Book of World Records estimated that Zhang was the most common surname in the world, but no comprehensive information from China was available at the time and more recent editions have not repeated the claim. However, Zhang Wei (张伟) is the most common full name in mainland China. This list of the 100 most common Chinese surnames derives from comprehensive surveys from 2007 and 1982. The first is derived from a report on the household registrations released by the Chinese Ministry of Public Security on April 24, 2007. The second is derived from the 1982 Chinese census whose zero hour was 00:00 on 1 July 1982. Although no list of surnames was published with the initial summaries, the State Post Bureau subsequently used the census data to release a series of commemorative stamps in honor of the then-most-common surnames in 2004. Previous partial surveys proved less accurate, as many surnames are clustered regionally. The summary of the 2007 survey revealed China had approximately 92,881,000 Wangs (7.25% of the general population), 92,074,000 Lis (7.19%), and 87,502,000 Zhangs (6.83%). These top three surnames alone accounted for more people than Indonesia, the fourth most populous country in the world. Detailed numbers for the other surnames were not released, but it was noted that seven others – Liu, Chen, Yang, Huang, Zhao, Wu, and Zhou – were each shared by more than 20 million Chinese and twelve more – Xu, Sun, Ma, Zhu, Hu, Guo, He, Gao, Lin, Luo, Zheng, and Liang – were each shared by more than 10 million. All together, the top hundred surnames accounted for 84.77% of China's population. By way of comparison, the 2000 census found the most common surname in the United States – Smith – had fewer than 2.4 million occurrences and made up only 0.84% of the general population. The top 100 surnames accounted for only 16.4% of the US population, and reaching 89.8% of the US population required more than 150,000 surnames. Vòng Wong Uōng Wong Viet. Vương *‍ɢʷaŋ Hjwang "King"
Li Ly Lí Lee Lí Lee Lî Lee Viet. Lý/Lí *‍C.rəʔ LiX "Plum"
Chin Viet. Trần *‍lrin Drin "Exhibit", "Old"
Yeong Iōng Yeong Viet. Dương *‍laŋ Yang "Aspen"
Fong Viet. Hoàng/Huỳnh *‍N-kʷˤaŋ Hwang "Yellow"
Ngô͘ (X, Q, K, T) Goh Ǹg Ng Ng Ng Viet. Ngô *‍ŋʷˤa Ngu "Loud"
Soon Sûn Sun Sun Suen Viet. Tôn *‍sˤun Swon "Grandson"
Baey Mâ Ma Mâ Mâ Viet. Mã *‍mˤraʔ MaeX "Horse"
14 14 朱 Zhū Chu1 Zyu1 Chu Chue Chu Choo Chû Choo Tu Chu Viet. Châu *‍to Tsyu "crimson"
Foo Viet. Hồ *‍gˤa Hu "mustache"
Kok Kuok Kwok Viet. Quách *‍kʷˤak Kwak "City wall"
Kau Koo Kou Kou Viet. Cao *‍Cə.kˤaw Kaw "Tall"
19 16 林 Lín Lin2 Lam4 Lam Lum Lîm Lim Lìm Lim Līm Līm Viet. Lâm *‍k.rəm Lim "Forest"
Law Viet. La *‍rˤaj La "Gatherer"
Seah Tshia Cheah Chhià Viet. Tạ *‍sə-lak-s ZjaeH "Thankful"
Phùng Foong Fūng Viet. Phùng *‍Cə.bəŋ Bjuwng "Gallop"
Siaw Sieu Viet. Tiêu *‍sˤiw Sew "Quiet"
Chung Tung Viet. Chung "Bell"
Hom Thâm Tham Thàm Tham Thóm Viet. Đàm "Talk"
60 69 金 Jīn Chin1 Gam1 Kam Gum Kim Kim Kîm Kim Kim Viet. Kim *‍kəm Kim "Gold"
Sak Shak Sak Viet. Thạch *‍dak Dzyek "Stone"
Kée (Z) Kia Ká Ka Kâ Viet. Giả *‍C.qˤ<r>aʔ-s KaeH "Merchant"
Hay Ha Ha Hà Viet. Hạ "Summer"
Phak Phak Viet. Bạch *‍bˤrak Baek "White"
71 68 熊 Xióng Hsiung2 Hung4 Hung Hong Hîm Him Yùng Yoong Hiūng Viet. Hùng "Bear"
Lui Lōi Viet. Lôi *‍C.rˤuj Lwoj "Thunder"
Liùng Loong Liūng Viet. Long "Dragon"
Mao Mōu Viet. Mao "Fur, Hair"
^ Pronunciations are based on the Xiamen (X), Zhangzhou (Z), Quanzhou (Q), Kaohsiung (K) and Taipei (T) varieties. 2006 multi-year survey and study conducted by Yuan Yida, a researcher at the Chinese Academy of Sciences's Institute of Genetics and Developmental Biology, using a sample size of 296 million spread across 1,110 counties and cities and recording around 4,100 surnames. 1990: Ji Yuwen Publishing House, based on a sample size of 174,900. 1987 study conducted by Yuan Yida with a sample size of 570,000. 1977 study published by Li Dongming, a Chinese historian, as "Surname" (《姓》) in Dongfang Magazine. According to a comprehensive survey of residential permits released by the Taiwanese Ministry of the Interior's Department of Population in 2016, Taiwan has only 1,503 surnames. The top ten surnames in Taiwan accounted for 52.77% of the general population, and the top 100 accounted for 96.56%. Other common surnames in Taiwan are listed by rank below. This report is based on the 2016 study. The ranking in the PRC (based on the 2007 study) is listed in the parenthesis. The Wade–Giles romanization is also listed first in the brackets, and the Hanyu Pinyin romanization is listed second in the brackets. 1994–2011: The American researcher Chih-Hao Tsai has compiled unauthoritative annual surveys of the most common surnames on Taiwan based on published lists of all successful applicants taking Taiwan's Joint College Entrance Exam. The test was mandatory for college entrance until 2002 and is still quite common, with more than a hundred thousand successful applicants a year and a pass rate for all test takers between 60 and 90%. Chinese Filipinos whose ancestors came to the Philippines from 1898 onward usually have single syllable Chinese surnames. On the other hand, most Chinese Filipinos whose ancestors came to the Philippines prior to 1898 usually have multiple syllable Chinese surnames such as Gokongwei, Ongpin, Pempengco, Yuchengco, Teehankee, and Yaptinchay among such others. These were originally full Chinese names which were transliterated into Spanish and adopted as surnames. There are also multiple syllable Chinese surnames that are Spanish transliterations of Hokkien words. Surnames like Tuazon (Eldest Grandson, 大孫), Dizon (Second Grandson, 二孫), Samson/Sanson (Third Grandson, 三孫), Singson (Fourth Grandson, 四孫), Gozon (Fifth Grandson, 五孫), Lacson (Sixth Grandson, 六孫) are examples of transliterations of designations that use the Hokkien suffix -son (孫) used as surnames for some Chinese Filipinos who trace their ancestry from Chinese immigrants to the Philippines during the Spanish Colonial Period. It should be noted as well that "Son/Sun" (孫) is a surname listed in the classic Chinese text Hundred Family Surnames, perhaps shedding light on the Hokkien suffix -son used here as a surname alongside some sort of accompanying enumeration scheme. Statistics Canada has not released a list of common surnames for any of its recent censuses, but much of the Canadian Chinese population is clustered in Metro Vancouver and Greater Victoria in British Columbia and the Greater Toronto and Hamilton Area and the Ottawa-Gatineau Area in Ontario, as well as in some emerging major clusters, such as the Calgary–Edmonton Corridor in Alberta, Montreal, and the Communauté métropolitaine de Québec (Quebec Community Metropolitan Area) in Quebec. Nearly as large is the Chinese Indonesian community. The 2010 Indonesian census reported more than 2.8 million self-identified Chinese, or about 1% of the general population. Just as in Thailand, though, previous legislation (in this case, 127/U/Kep/12/1966) had banned ethnic Chinese surnames throughout the country. This law was abolished after the removal of Suharto, but Chinese Indonesian names remain a mix of Indonesian, pinyin, peh-oe-ji, and Dutch-influenced Hokkien. During the 2010 Malaysian Census, approximately 6,960,000 Malaysians of Chinese race. Chinese is the second largest race in Malaysia, after the Malays. Ethnic Chinese make up almost three-fourths (2009) of Singapore's resident population of nearly four million (2011). Do take note that the 7th most common surname in China, 趙/赵, is extremely rare in Singapore. The largest Chinese diaspora community in the world are the Chinese Thais (or Sino-Thais), who make up 12–14% of the total Thai population. However, very few of the Chinese Thais have Chinese surnames, after the 1913 Surname Act that required the adoption of Thai surnames in order to enjoy Thai citizenship. Moreover, the same law requires that those possessing the same surname be related, meaning that immigrant Chinese may not adopt the surname of their clansmen unless they can show actual kinship. The 2010 US Census found 3,794,673 self-identified Chinese Americans and 230,382 self-identified Taiwanese Americans, up from 2,734,841 Chinese Americans and 144,795 Taiwanese Americans in 2000. Although the Chinese make up the largest segment of the U.S. Asian and Pacific Islander population, the most common Chinese-derived surname during the 2000 census was not itself Chinese but the Vietnamese Nguyễn (Chinese: 阮, Ruǎn). ^ a b c United States Census Bureau. "Genealogy Data: Frequently Occurring Surnames from Census 2000 Archived 2009-12-21 at the Wayback Machine". 27 Sept 2011. Accessed 29 Mar 2012. ^ a b Word, David L. & al. "Demographic Aspects of Surnames from Census 2000 Archived 2010-10-13 at the Wayback Machine". 26 Jun 2001. Accessed 3 Feb 2012. ^ Prest, Kevin. "X三Y四: Similar Chinese Idioms (Chengyu) Archived 2014-07-20 at Wikiwix". 4 Mar 2011. Accessed 5 Apr 2012. ^ a b 全國姓名統計分析. Ministry of the Interior, R.O.C. (Taiwan). 2016. ISBN 9789860503043. Archived from the original on 2017-12-16. ^ McFarlan, Donald. 1990 Guinness Book of World Records. Sterling Pub. Co., 2001. ISBN 189205101X. ^ People's Daily Online. "China issues first set of stamps of Chinese family names Archived 2012-02-29 at the Wayback Machine". 19 Nov 2004. Accessed 28 Mar 2012. ^ Badan Pusat Statistik. "Population of Indonesia by Province 1971, 1980, 1990, 1995 , 2000 and 2010 Archived 2011-07-18 at the Wayback Machine". 2009. Accessed 29 Mar 2012. ^ Lafraniere, Sharon (21 April 2009). "Name Not on Our List? Change It, China Says". The New York Times. Archived from the original on 15 August 2017. ^ Baxter, Wm. H. & Sagart, Laurent. "Baxter–Sagart Old Chinese Reconstruction". Archived from the original on 2012-04-25. (1.93 MB). 2011. Accessed 17 March 2013. ^ 周长楫; 王建设; 陈荣翰; 林美治; 郭锦标, eds. (2006). Minnan Fangyan Da Cidian (in Chinese) (1st ed.). Fuzhou City: Fujian People's Publishing House. ISBN 7-211-03896-9. ^ Dictionary of Frequently-Used Taiwan Minnan (in traditional Chinese). Ministry of Education, R.O.C. "Archived copy". Archived from the original on 2013-06-21. Retrieved 2013-02-20. CS1 maint: Archived copy as title (link). Retrieved 19 September 2014. ^ historian, Al Raposas is a Filipino Christian; world, writer In his eagerness to write history for all the people around the; appearances, he began the Filipino Historian in 2012 Due to his; Philippines, invitations to various media stations in the; Facebook, he is becoming known as the nation's "youngest historian " Follow him on; Twitter; Copyright © 2012-2019, Instagram. "Catalogo alfabetico de apellidos: List of Chinese surnames". Filipino Historian. Retrieved 2019-02-09. ^ ZDIC.NET. "杜的解释-杜的意思-汉典"杜"字的基本解释". www.zdic.net. Archived from the original on 21 September 2017. Retrieved 4 May 2018. ^ "%E5%B4%94 | Definition | Mandarin Chinese Pinyin English Dictionary | Yabla Chinese". chinese.yabla.com. Retrieved 2016-08-23. ^ The results of this survey were previously published at the National Citizen Identity Information Center's website at "Archived copy". Archived from the original on 2008-04-21. Retrieved 2015-05-15. CS1 maint: Archived copy as title (link). However, the link is now dead. ^ Tsai, Chih-Hao. "Common Chinese Names Archived 2014-10-18 at the Wayback Machine". 8 Aug 2011. Accessed 30 Mar 2012. ^ a b Tsai, Chih-Hao. "A List of Chinese Names Archived 2012-04-15 at the Wayback Machine". 8 Aug 2011. Accessed 30 Mar 2012. ^ a b "Philippines Genealogical Resources". Forebears. Archived from the original on 2016-08-12. ^ a b Shah, B. R.; Chiu, M.; Amin, S.; Ramani, M.; Sadry, S.; Tu, J. V. (2010). "Surname lists to identify South Asian and Chinese ethnicity from secondary data in Ontario, Canada: A validation study". BMC Medical Research Methodology. 10: 42. doi:10.1186/1471-2288-10-42. PMC 2877682. PMID 20470433. ^ Kewarganegaraan, Suku Bangsa, Agama dan Bahasa Sehari-hari Penduduk Indonesia Hasil Sensus Penduduk 2010. Badan Pusat Statistik. 2011. ISBN 9789790644175. Archived from the original on 10 July 2017. Retrieved 6 December 2018. ^ "Population and Housing Census, Malaysia 2010 (2010 Census)". Malaysia: Department of Statistics, Malaysia. 2010. Archived from the original on 2011-08-24. Retrieved 4 Apr 2011. ^ Statistics Singapore. "Popular Chinese Surnames in Singapore". ^ US State Department. "Background Note: Thailand Archived 2009-11-04 at the Wayback Machine". 3 Jan 2012. Accessed 4 Apr 2012. ^ US Central Intelligence Agency. The World Factbook. "Thailand Archived 2015-07-03 at the Wayback Machine". 20 Mar 2012. Accessed 4 Apr 2012. ^ United States Census Bureau. "QT-P8 Archived 2014-12-18 at the Wayback Machine. Race Reporting for the Asian Population by Selected Categories: 2010 2010. Census Summary File 1". 2010. Accessed 3 Apr 2012. ^ United States Census Bureau. "The Asian Population: 2000 Archived 2010-06-01 at the Wayback Machine". Feb 2002. Accessed 3 Apr 2012. ^ United States Census Bureau. "Census 2000: Chinese Largest Asian Group in the United States Archived 2017-01-18 at the Wayback Machine". 4 Mar 2002. Accessed 29 Mar 2012. ^ Other popular Asian & Pacific Islander names are the Vietnamese names Nguyen (#1), Tran (#5), Le (#8), and Pham (#13); the Korean names Kim (#3) and Park (#15); and the Indian names Patel (#4) and Singh (#16). ^ a b Lauderdale, Diane S.; et al. (2000). "Asian American ethnic identification by surname" (PDF). Population Research & Policy Review. 19: 283–300. Archived from the original (PDF) on 2013-01-02. .
^ Falkenstein, Matthew R. "The Asian & Pacific Islander surname list: as developed from Census 2000 Archived 2013-03-07 at the Wayback Machine". Joint Statistical Meetings 2002. (New York), 2002. This page was last edited on 4 April 2019, at 04:42 (UTC).